Hyponatraemia or Is reducing salt bad for you? Is Reducing Salt Bad For You? Could Lowering Salt Intake Could Increase Risk of Heart Attack? The following report about hyponatraemia is controversial inasmuch as it goes in the face of accepted wisdom. I intend to bring you all breaking news regarding the results of new studies and research, but please use caution when implementing new and cutting edge information which has not been validated by national and international authorities. Until these reports have been validated or rejected by these health authrorities please consult your doctor, especially if you have a problem with blood pressure or other related health conditions. Information in this site and in fact, any information accessed via the web should be used to support your efforts to live more healthily, but does not replace the adviice of a trained medical practitioner. Always consult your doctor if you have health concerns. According to the Health Science Institute (USA) recent trials have shown that lowering sodium intake may actually increase risk of heart attack and death. "In three different trials that tested low-sodium diets on patients with kidney disease and heart failure, results linked the special diets to higher risk of hospitalizations, cardiovascular events, and death. In a recent Journal of the American Medical Association (JAMA), Dr. Michael Alderman (a past president of the International Society of Hypertension) called for large- scale clinical trials that will hopefully produce definitive data on what outcomes can be expected in following a reduced-sodium diet. And why would we need those trials? According to Dr. David McCarron — a nutritionist and University of California professor — there's currently no reliable evidence that backs up the accepted recommendation to reduce sodium intake for heart health. Dr. McCarron says the recommendation is based only on opinion and the demonization of salt by health authorities. One of the key points in the Unites Sates Department of Agriculture’s (USDA) dietary recommendations: Significantly reduce sodium intake. 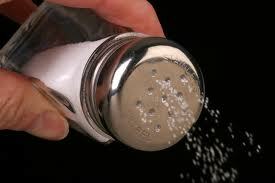 Writing about the new USDA recommendations in Canada's Financial Post, Dr. McCarron has more salt myths to bust. Last year he led a study that measured daily salt intake in more than 19,000 subjects from about 30 countries. The three surprising conclusions: 1) Americans consume no more salt than people in other countries 2) Salt consumption in the US has NOT increased over the past 25 years 3) No matter how salty your food, your body naturally regulates your intake, so you wind up with a consistent overall intake This is why deliberately forcing down your salt intake is a bad plan — not healthy at all. Your body takes what it needs. And it does need sodium. Several years ago, German research showed that as many as 1 in 10 seniors suffer from hyponatraemia (low blood levels of sodium). Hyponatraemia usually goes undiagnosed because symptoms are similar to conditions we associate with ageing: fatigue, confusion, poor balance, and incontinence. In advanced hyponatraemia, patients have hallucinations and may even lapse into a coma. The German study reported that a large majority of the elderly subjects said they avoided salt based on the popular misconception that salt intake causes high blood pressure. "